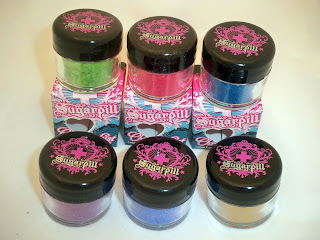 Home sugarpill cosmetics Sugar Pill Cosmetics Review & Giveaway! I was so excited for this review. For a while, I've heard about the amazingness known as SugarPill Cosmetics and I finally had the chance to test out some of their products. This year at IMATS, I met the wonderful Amy aka Shrinkle, owner of SugarPill. She was super nice and sent me some goodies to try out after. You all know I love me some bright colors so this line was right up my alley. A+ for packaging! 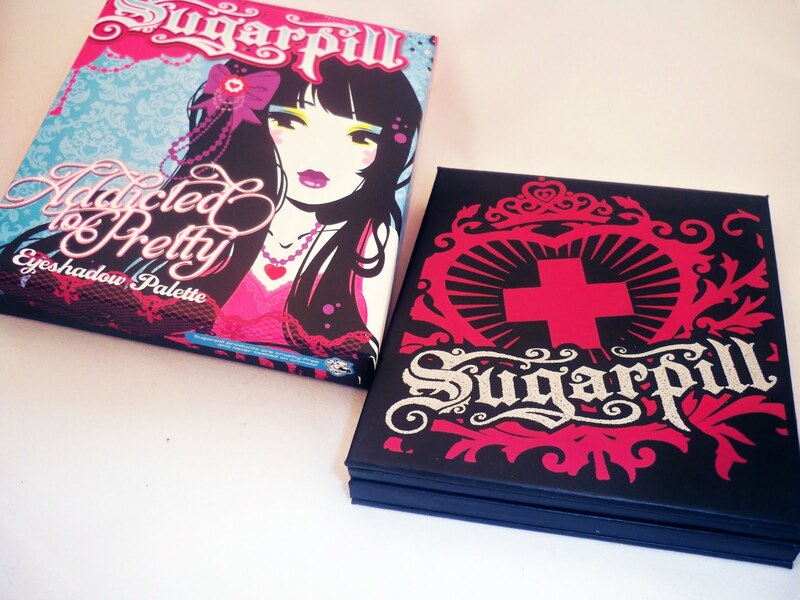 It's obvious that the packaging was meticulously created to convey the SugarPill lifestyle. Even the boxes are super cute. If I saw this on a shelf at Sephora, for example, I would immediately pick it up at least to look at the design. The boxes don't have the names of the product printed on them but I heard that this change will come in the future. The pressed shadows, loose shadows, and palettes are all especially created for this brand. There are no cheap stickers which would give you the idea that this is a repackaged brand from a private labeling company. These are just too gorgeous. You get a lot of products and the colors are magical. A lot of them seem to contain a type of reflects glitter which makes the pigment sparkle. Be careful because many of these are filled to the brim and you don't want any spillage. These loose shadows are super vibrant. Some of the colors require a bit of patting to get an even coat...you can also foil them to achieve a uniform coat. Absinthe: Gorgeous lime green shade with lots of greenish/yellow shimmer. Decora: Another hot pink, yay! This one is a little softer than Dollipop eyeshadow. It's a hot pink with blue reflects glitter. Goldlilux: Hands down, this is the prettiest Gold pigment ever. It swatches as super pigmented and has a metallic sheen with super tiny glitters that just shine. Great as a body shimmer too! Hysteric: This metallic purple shade is more subtle than Poison Plum eyeshadow. It's a metallic shade with a reflects teal glitter. 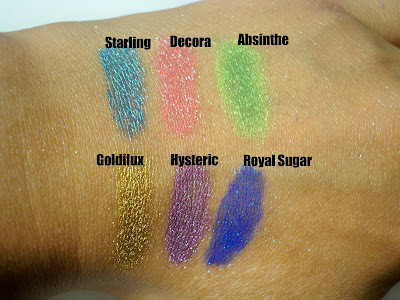 Royal Sugar: I love gorgeous blue shadows. This is a royal blue with gorgeous turquoise shimmers. Gawjus! Starling: Super shimmery turquoise blue with lots of shine...can you say bright pop of color on the lower lashline? I received Poison Plum to test out. It's been toted as a possible MUFE 92 dupe. It has more of a blue undertone than the MUFE version but it's just as great. It's insanely pigmented but watch out because you'll most likely get a little stainage from it due to the carmine in the ingredients (thanks Amy for the tidbit of knowledge!). The pan is huge and I love the clear lid so you can see what color you're getting. This is my favorite color in the bunch. I received the quad in Sweetheart which contained the colors Dollipop, Afterparty, Midori, and Tako. I think Amy picked this one out for me because I told her I loved hot pink. Dollipop: Super bright hot pink in a matte shade. Really pigmented. Not chalky. Afterparty: Gorgeous marine blue color. It has a bit of a metallic sheen which makes it even more gorgeous. My favor color in the bunch. Midori: Vibrant green shade with a bit of sheen...very much the color of the drink Midori Sour. Tako: This is a pure white matte shade. It's a good balance to the other bright colors to use as a highlight or to help with blending. 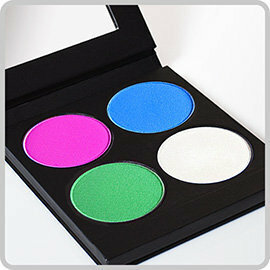 The palette itself is made of durable cardboard with the SugarPill design on front. This is a great value for the eyeshadows. If you're trying to build up your colors, this is the most cost effective way is through the palettes. They contain the same shadows that are available in the pressed color design. There's a large mirror which is handy for travel and daily use. I would definitely recommend this line. If you're a bright color lover, this is a definite. If you're into neutrals, you could always pick up some colors to do the bright pop of color on the lashline technique. Some of the loose shadows like Goldilux are also very wearable. SugarPill has really made a splash in the world of cosmetics where many companies were seeming like drones of one another. This company really stands out with its innovative design and products. The prices are affordable enough to try out at least some of their products. I feel like their bright matte shadows are comparable to MUFE but at a fraction of the price. We always wait for MAC to have limited edition collections with super bright colors but SugarPill has them now and they're not going anywhere. I see big things for this line and I know they plan on doing more products. Can't wait! You can find these products at http://www.sugarpillshop.com/. Definitely check out the site. It's very bright, fun and easy to navigate. There are even real swatches for the shades. Each delivery comes in a special SugarPill box which also contains some of their nifty logo stickers. They have an amazing shipping offer which is only $5 flat rate on U.S. Orders. Free worldwide shipping on orders over $75. Follow my blog, Subscribe to my YouTube, and Follow me on Twitter...I will have a giveaway on each of these sites. You can enter on all three to increase your chances of winning. YouTube Entry: Leave a comment on the video wall telling me which product you'd like to win (either Poison Plum or Goldilux) and why. I'll pick two winners of each. Blogger Entry: Leave a comment on this post telling me which product you'd like to win (either Poison Plum or Goldilux) and why. I'll pick two winners of each. Twitter Entry: At a random point during the week I will have a giveaway asking a trivia question. First to answer correctly wins. I'll do two giveaways - one for Poison Plum and the other for Goldilux. I love the Poison Plum shadow! The pigmentation looks amazing and I would love to try it out! Poison Plum! Purple is my favorite color and that one is beautiful. I'd be just as happy with Goldilux, though. I'm not picky. I would love to try the Poison Plum eyeshadow. I love purple it is my favorite color :) I would love to try the eyeshadow so that I can order more!! Poison Plum Please. This year I have purchased so many items that have turned out to be duds. I have been eying this product since it came out and I am dying to try it. I would love to win Poison Plum so that I can find out if this brand is for me. i would love to win the poison plum eyeshadow its a beautiful color! I would absolutely love to win Poison Plum! I love love LOVE purple shadows! This one is so pigmented and rich and beautiful it would be so awesome to be able to win this product! 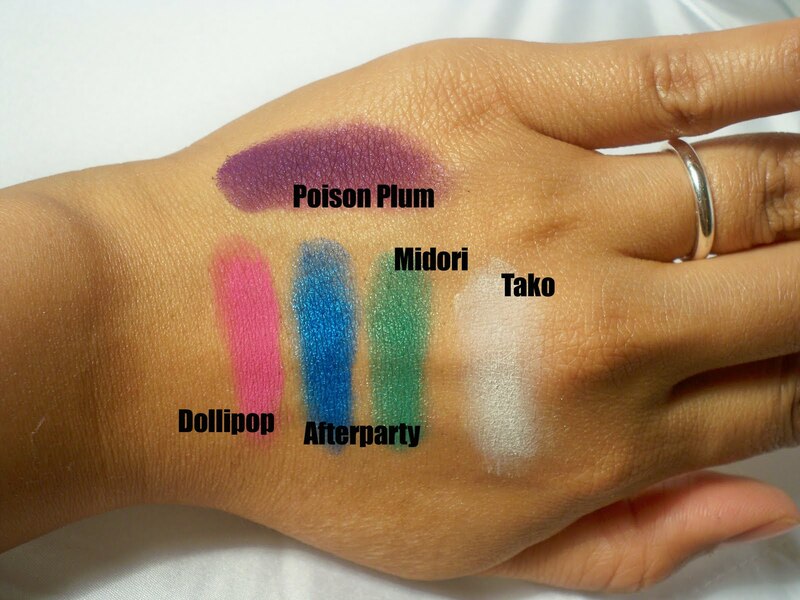 i would love the poison plum eyeshadow, because its such a vibrant color. I would love to win the gold pigment because it just resemble liquid gold and I have just the right outfit to amp it up with. Thanks for the opportunity to have a chance at winning. Be Blessed!!! It's so hard to decide what color I want the most! ; but I think I'd like to have Goldilux more. I've never had a loose shadow before and, being a baby make up enthusiast, I can really use the experience with this product and it would be nice to have a gold shadow (which I surprisingly don't have). I've been eying Sugarpill for a while but, unfortunately, I've no money to purchase. I'll definitely be buying from them when I can, though. Thanks for having another great contest Ren! I would want to win the Poison Plum because I love purples and this purple looks so unique! Ooh that's tough! I would pick the poison plum b/c I don't have a gorgeous purple yet. I've been holding off from picking up a MUFE92. I would love to win poison plum because i've been wanting to try out sugar pill for a while and this violet is so beautiful. I would love to win the Goldilux, the color is so pretty. I love golds. I would love to win the Poison Plum shadow! It's beautiful and very pigmented (just like all of Amy's products!) I wouldn't mind Goldilux too though, Either are perfect for me! I love the Poison Plum eyeshadow. I would like to win because purple is my favorite color and i hear these shadows are very pigmented. I would love to try it out. I would love goldilux because I am constantly wearing gold on my eyes. I guess since I live in florida near the beach I find it appropriate. thanks for the giveaway !! i would love to have a chance to win goldilux because gold eye shadows are my best friend <333 i adore them and this one is just soo gorgeous! I'd Like To Win Goldilux Because It Looks So Intense & Metallic. Goldilux..is the one id would love to win..i dont have any gold and love to have my eyes stand out..it looks really pretty and this would be my first item from sugarpill!!!! i love decora loose shadow :) the pigmentation is amazing i love it. i never tried it b4. so cool! My husband is organizing a celebration for my birthday in September. I will complete 51 years and want to be beautiful. I think the Goldilux pigment blending with one eyeshadow black will give a touch of class to my makeup. I cross my fingers to win. I would love to try the Poison Plum eyeshadow! Goldilux because i can wear it everyday. Yay! I've always wanted to try Sugar Pill, but I haven't had the money to spend on makeup yet hehe. honestly I would love to win both :p but if I had to pick, I would pick Goldilux, just because it's so hard to find pigmented golds and yellows! the colors look gorgeous and bright! thanks Ren for the review and giveaway!! I would love to win Goldilux because it is such a unique color and it would be amazing to have in my small collection. I definitely want **** Goldilux *** !!!!!!! i would love to win poison plum ren its such a pretty color & i would love to create a smokey eye with it bcuz i LIVE for smokey eyes lol love using my 224 its excellent for blending out a smokey eye poison plum looks so pigmented it screams SMOKEY EYE to me! plus i have never purchased any sugar pill prouducts so this is a great chance to try it out! I would like Goldilux please, if I win! It looks gorgeous and I would love to try it! I would like to win the Goldilux shadow because that shimmer is gorgeous! I would love to win poison plum, because I completely adore purples but never found any bright eyeshadow in that shade. thank you! love! I would love to try the Poison Plum e/s as I'm absolutely mad for Sugarpill!!! I would love to try Poison Plum!! It looks super pigmented and the color is amazing! Poison Plums my favourite! So bright and beautiful and I love purple's for a smokey eye! I would really like to win Poison Plum. It is so beautiful and possible the most beautiful shade of purple I have ever seen. i would really enjoy poison plum! i haent found that perfect purple shadow yet and this looks close! I'd love to win poison plum because it looks amazing. Poison Plum! I am a purple addict, love purple with my green eye! Ciao from Italy! I would love to win Goldilux! I've been eyeing the palettes for a long time, So gorgeous. I already own MUFE #92, Poison Plum is an amazing dupe, I wish I knew about it before I bought #92. OMG Im so glad i came to your page today!!!! i would love the goldilux, its such a gorgeous gold, and I love how gold looks on me, I would love to try it!!!! goldilux looks absolutely great! i would have gone for poison plum eyeshadow, but the gold sparkles just definitely caught my eyes! I would like poison plum because it's a beautiful purple and I don't have any color like it in my collection. Thanks so much Ren! i love the poison plum! I have so many gold shadows, and virtually no purples. I would love to try it out. Hi RenRen. I love the review on the Sugarpill products. I'd like to win the Poison Plum eyeshadow, because it looks amazing. And purple? Kind of my favourite colour. I'd love the poison plum shadow. The color looks amazing! I'd love the poison plum... beautiful color! I would love the Goldilux, I can never seem to find a true gold color that has that much OOMPH! Thank you so much for doing these reviews and giveaways for us! I would love to win the Poison Plum.. The colour is amazing and its seems so pigmented.. I love it! id love goldilux cause that is the prettiest gold i have ever seen!!! I would love to try the poison plum shadow because i am just getting into makeup and i don't have any color like this one yet! It is so gorgeous! I would love to win Poison Plum! purple is one of my fave shades and I've been dying to try out some sugarpill! I'd love to win Goldilux...love the cute name! I have brown eyes with gold specks in them. Goldilux would def highlight the gold in my eyes. Also I love loose shadows. Thx Ren xoxo! I would love to win poison plum shadow or goldilux! I like both because I love both colors. I would love to try them out. Since I could only pick one it doesn't matter if I win the poison plum or the goldilux! I would love the Goldilux loose shadow because I LOVE GOld shadows! I would love to win Poison Plum. I'm in love with pink and purple eyeshadows! omg After seeing Julieg213's "sunset" vid with Sugar Pill cosmetics, I tried to do a cool-toned version like you have on your lids in your review video! Super cute Ren!!! I'd love to win!!!!!!! I'd love Poison Plum!!! yaynesss! I would LOVE to win Poison Plum! I've heard nothing but rave reviews about it, and I can't think of another purple that even compares! I would love to win Goldlilux!! it is sooo goregous!! Hi! I would love to win Goldilux as gold eyeshadows are my favorites!! I would love to win Poison Plum! I'm obsessed with purple! ESPECIALLY MUFE #92! It would be awesome to to play with something different and maybe even better! I would love to win the Goldilux its a pretty gold and it would go nice with some pinks and browns shades. I love Poison Plum......purple is my favorite color!!! Poison Plum!!!!! Cause you can never have too many purples!! Wherever I have lived I always have a room painted purple...I live for purple everything!! I would loveeeee to recive Golilux!! I absolutly loveeeeeeeee loose eyeshadows!!! Plus... I have alot of purple and i am trying to branch out.. I dont have any gold but i have been meaning to pick one out! i have tryed some... and they just arnt pigmented! thanks for doing this giveaway!!! Good Luck everyone! i would love to win the poison plum bc i love purple and i would love to try sugarpill cosmetic. I would love Goldilux! It's just such a nice gold and I always wear golds and browns. I would love to win Poison Plum.I seems to be like the perfect purple I've been searching for so long! I'd love to win goldilux. Just looks way too glam and pretty! I would love to get Goldilux becuase I really lack some good pigments and loose shadows and I would love to have more. And this gold is to DIE for. Its so pigmented and pretty, It is like the perfect gold that I always wanted. I would love to finally try Sugar Pill! Since I have green eyes and black hair, Poison Plum all the way! Thanks! I would love the Poison Plum. Purple is my favorite eye shadow color. I love how it looks with brown eyes! I would love to try the Goldilux, everyone that has it seems to love it! it's such a powerful eyeshadow i want to wear it every day and night! I would love to win Poison Plum because you can never have enough purples! I buy tons of pinks and purples, in general. I would love to have some Goldilux! I'm subscribed to you on here under buzziebaby on twitter by the way. I would love to win Poison Plum since I don't have any good purple eye shadows and I hear this one is a little similar to the MUFE purple, which i've always wanted but still haven't purchased. I would love to win goldilux because i don't have any loose powder or gold eyeshadow at all. I think it would be very fun to play with! Thank you for such an awesome giveaway! I would love to win Poison Plum. I just ordered Goldilux and absolutely love it but i don't have any of the pressed shadows yet. Purple is my favorite and I've heard everyone raving about those shadows! I would love Poison plum. I create and wear costumes and the bright pigmentation is amazing with the costume and in the photographs. I've read yours and many other reviews and Heard Sugarpill is a amazing Brand. I would love to win thee 'Goldilux', simply because im a pigment kinda girl, and glitters, and shimmers are AWESOME! Goldilux! I love Shrinkle and have been hearing nothing but raves about it and can't wait to try it. Also because it would match my skin tone and be awesome for an accent or for the entire lid. I want goldilux. I've seen it with the burning heart palette I want to get that and try them together! i love the poison plum shadow the most! the color & packaging is gorgeous :] & purple is my favorite color! thanks for hosting this contest/giveaway renren! Loved the review! I just received a palette [Cold Heart] and a chromalust [Junebug] in the mail the other day but I had watched your makeup tutorial on the line previously. I found it very helpful and your review is fantastic so thank you for posting both! The Goldilux is amazing! I'd love to own any of the shadows from this line. I absolutely love Amy (Shrinkle). I like that her makeup line and clothing line aren't what society deems "beautiful". She's beautiful in her own way and she does it so well. So, I'd want to own a shadow from this line because I like what it represents. I would love to win the Poison Plum shadow! Purple is my favorite color, I had heard great review of this products, and i dont really have any purple eyeshadow, this would be a great eyeshadow color for me :) I'm dying to test this product out! Once upon a time, a little girl named Spunkii purchased chalky purple crap from Hot Topic called Bloody Mary. This made her VERY unhappy. But then she found a solution to it all: Sugarpill Poison Plum. This, brought her great joy! I don't actually own Poison Plum, but I fell in love with Tiara and Love+ after purchasing them a month or so ago. Poison Plum would be a great addition to my collection instead of the chalky powder I have that doesn't blend well at all. I definitely intend to invest in more Sugarpill soon. I would love to win Poison plum, because purple is my favorite color. It's always hard to find a vibrant enough purple for my eyes. I think this color will do the trick, it's just so pretty! i would love poison plum! its my favorite color. purple! atleast its my favorite color right now. I would have to say Goldilux because as many purples as I have I could probably dupe Poison Plum...they are both gorgeous though!! However that Goldilux is rocking! I would love to win Goldilux because purple is already something I am comfortable with and I want to step out side of my comfort zone!! So Gold, here I come! I would love to have the poison plum because purple is my absoulute favorite color!! I am just starting to get into makeup and making this shadow as one of my first products would be wonderful!! I also love Sugarpill and their packaging! i would loveeee thisss. purple is one of my favorite colors! OOOOooo if you pick me i would LOVE a Goldilux! I'm a sucker for metallic shades and i don't have a gold yet!!! Thanks beautiful! poison plum please, looks like an awesome deep purple. I would love to win the Poison Plum!! Purple is my favorite color and the Poison Plum is so rich and vibrant and pretty! It's perfect! Goldilux! It looks like a really beautiful yellow gold. I haven't had the chance to try any products from Sugarpill but from all the great reviews that I hear about them, they sound amazing! I'd LOVE to add Goldilux to my collection!!! Poison Plum. I'm the girl who commented on your youtube who told you about the homecoming drag queens. Because youtube only allows 500 characters, I was unable to say everything I wanted. Because I'm a teenager without a job and without an allowance, I can't afford Sugarpill makeup. I've heard great things about Sugarpill and would like to try them out. Please pick me, to quote Shrinkle,"I hope I've made those drag queens proud!" I would love to win Poison Plum. I like gold, but only certain ones work with my skintone. With purples, I've never met a shade that didn't look great. Plus, Poison Plum is really intense. I'd love to wear it often. goldilux is so﻿ gorgeous! I'd like the pigment because it looks so vibrant and﻿ pretty. I would very much like to try out Goldilux! It looks just beautiful! Although I wouldn't mind Poisen Plum either but Goldilux is just to hard to pass up. Thanks for doing this! I so love purple... i had that color for my 18th bday and my wedding. So I would love to win the poison plum. OMG That poison plum looks crazily amazing!! I'd love that! Such a colour that can make your eyes pop without overdoing it and so hard to find, that colour! I've been curious about Sugarpill and I think you've convinced me to try it out! I would like Poison Plum. I love purples! I would love to get the Poison Plum shadow. The color looks amazing. Purple is my favorite color! I dont have any purple eyeshadow, and would love to have this my first purple eyeshadow. It's so hard to decide what color I want the most! ; but I think I'd like to have Goldilux more. I've never had a loose shadow before and, being a baby make up enthusiast, I can really use the experience with this product and it would be nice to have a gold shadow (which I surprisingly don't have). .I would love to win the gold pigment because its just resemble liquid gold .. Thanks for the opportunity to have a chance at winning . Goldilux. Gold has always been a color in my everyday use and where I live, it's kind of hard to find any good gold pigments. This would be perfect! Wowses, I am not a picky girl, ANYTHING made by SUgarpill would suit me just fine if i were to win. Can I say either?!! I love both and would love to try Sugar Pill. BUT if i had to pick just one....I'd go with Poison Plum, because I love purples! I would really love to have the poison plum because I have not yet had a purple color of that shade & think it would be an awesome addition to my collection & would get used quite often! I would love to try either color. I have always wanted to try bold pigmented colors on my face but have always been scared to. As a beginner, I would love to add either color to my collection. I went to the MAC counter last week and the girl there kept insisting I try on the purple shadows because it would compliment my skin tone. As it turned out, it looked really cute! I would love to win 'poisen pen' cause I'm a huge purple lover. Thanks for this opportunity. I would love to win the Poison Plum. I have been watching tutorials on youtube using Sugarpill.It looks like a eyeshadow that doesn't disappoint. My kit and personal makeup is lacking a rich purple color. I would love it to create a cotton candy inspired look. OOh Those are so pretty! I like Goldilux better than poison plum but only because I have some purples but I don't have any real Golds. Just..shimmery yellows you know? Hi Ren, I would love to get poison plum, it's sooooo beautiful!!! Hey ren! I'd love to win the poison plum eyeshadow! Super cute!! Thanks ren! goldilux because its looks awesome! The Goldilux would be a great addition to the color palette I'm using for my brother's wedding. (The makeup's for his fiance, not him :-)) Anything to make my brother's new wife glow! I'd love to win Poison Plum because it looks so beautiful and its my favorite color. I don't own a lot of make up, but I'd love to. Makeup is such a fascination to me. It'd mean so much. Thanks!